If we head over there we see similar stuff as we do on Windows. Basically c:\program files\dotnet is the same as /share/dotnet. Looking in directories works to figure out what SDKs and Runtime versions are installed, but the best way is to use the dotnet cli itself like this. There's great instructions on how to set up .NET Core on your Linux machines via Package Manager here. Note that these installs of the .NET Core SDK are installed in /usr/share. I can use the dotnet-install.sh to do non-admin installs in my own user directory. The main usefulness of these scripts is in automation scenarios and non-admin installations. There are two scripts: One is a PowerShell script that works on Windows. The other script is a bash script that works on Linux/macOS. Both scripts have the same behavior. The bash script also reads PowerShell switches, so you can use PowerShell switches with the script on Linux/macOS systems. 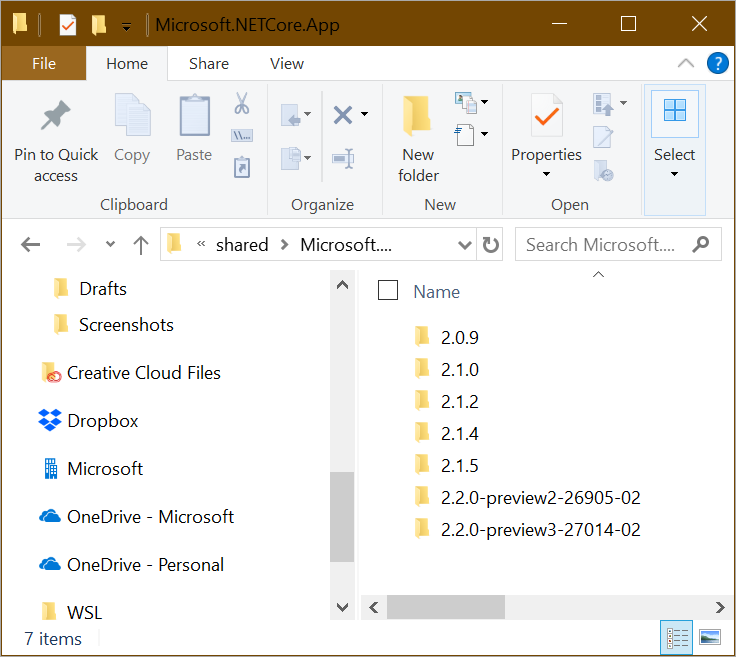 For example, I can see all the current .NET Core 2.1 versions at https://www.microsoft.com/net/download/dotnet-core/2.1 and 2.2 at https://www.microsoft.com/net/download/dotnet-core/2.2 - the URL format is regular. I can see from that page that at the time of this blog post, v2.1.5 is both Current (most recent stable) and also LTS (Long Term Support). I'll grab the install script and chmod +x it. Running it with no options will get me the latest LTS release. Connecting to dot.net (dot.net)|104.214.64.238|:443... connected. I like the "-DryRun" option because it will tell you what WILL happen without doing it. If I use the dotnet-install script can have multiple copies of the .NET Core SDK installed in my user folder at ~/.dotnet. It all depends on your PATH. Note this as I use ~/.dotnet for my .NET Core install location and run dotnet --list-sdks. Make sure you know what your PATH is and that you're getting the .NET Core you expect for your user. Now I will add a few more .NET Core SDKs side-by-side with the dotnet-install.sh script. Remember again, these aren't .NET's installed with apt-get which would be system level and by run with sudo. These are user profile installed versions. There's really no reason to do side by side at THIS level of granularity, but it makes the point. When you're doing your development, you can use "dotnet new globaljson" and have each path/project request a specific SDK version. The template "global.json file" was created successfully. It would be useful to be able install latest version of .Net Core 2, and also remove previously installed .Net Core 2 versions (unless if this breaks something?). For me, its a little more convenient to install via a package manager rather than navigating to the site and downloading. All I can think about is just having a Powershell Core script as a wrapper for both the Powershell and Bash install scripts. Can someone recommend some good hands on tutorials/learning resources for .NET Core. It's so different to full fat .NET nowadays I really need to get on it now it's maturing a bit. I'd like to try converting a ASP.NET MVC 5.2 site to core to see how much benefit I can get out of those speed improvements in the request pipeline that I've seen demonstrated in conference videos I've demonstrated. Hi Scott. This script has always been a source of frustration for me. I like the option of being able to do a local non-admin install, and I am glad you guys worked to make sure this is possible and easy. When provisioning build servers I need/want the same ability to run any version of dotnet sdk for any user (as root i am installing something that the 'jenkins' user needs available when the process runs under that user). The number of scenarios where I have multiple human users using the same machine, needing local specific versions of dotnet is non-existent, and a local per-user install is pointless, and the global Linux installers (apt,yum) don't support side by side installs of multiple versions. We end up building/maintaining our own custom installer scripts, and that is very annoying given that this script already exists, and the fact that the download page (on dot.net) you guys are so proud of makes it very difficult to even find the proper (post-redirect) download link for each version and component needed. I feel like this script is great for YOU GUYS. What I mean is, I am sure it is frustrating for you in a demo/conference/workshop to have corporate locked down machines that cant event install the sdk/runtime. But that really isn't a problem faced in the real world.